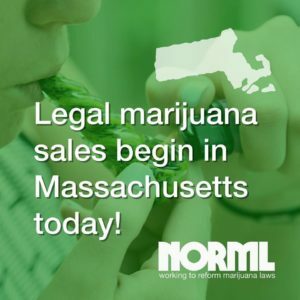 On November 20th, just two days before Thanksgiving, adults over the age of 21 were able to legally purchase marijuana in the state of Massachusetts for the first time in over a century. Massachusetts was the first state to enact marijuana prohibition — doing so on April 29th, 1911. Voters decided in favor of repealing the ban in November 2016. On the very same day, Representative Joe Kennedy III — who had historically been one of Congress’ leading marijuana prohibitionist — published an op-ed documenting his evolution of thinking when it comes to cannabis and announcing his new position of supporting reform.